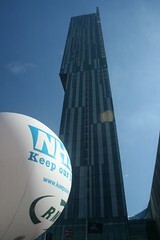 We are writing to you to ask you to affiliate to Keep Our NHS Public in Greater Manchester. 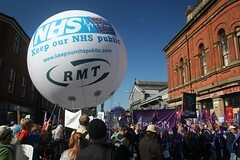 Keep Our NHS Public is a national network of trade unionists, community campaigns and local groups. We are opposed to the fragmentation and privatisation of the National Health Service, including the detriment suffered by NHS workers under this process. 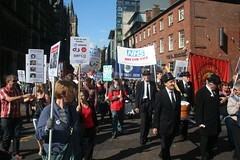 We have organised numerous protests, events and meetings across Greater Manchester. We hold monthly Gtr Mcr meetings to bring together local groups which are linked with us in almost every borough of Greater Manchester. We support local community campaigns, provide advice over how to combat privatisation, and produce regular newsletters and run a website. 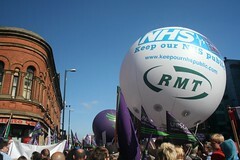 We have supported all trade union campaigns/disputes by health workers and many of our supporters are activists in the health trade unions. We also do regular e-circulars to keep everyone informed of news and events. 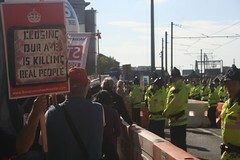 We are asking you to affiliate and make an affiliation donation of as much as you can afford, to enable us to produce leaflets and other campaign resources, to hold organising meetings and public events, and so on. We would be happy to provide a speaker for a meeting. If you agree to affiliate, please make the cheque payable to “Greater Manchester Keep Our NHS Public” and send to group treasurer Norma Turner at 58 Langdale Road, Manchester, M14 5PN.